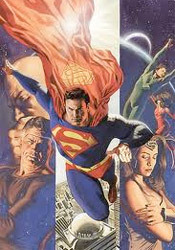 In the final chapter of this Elseworlds revival tale, the El family is confronted by the consequences of their crash landing on and eventual adoption of the planet Earth. Departing their doomed homeworld as a family, rather than merely jettisoning their infant son in a tiny experimental rocket, the Els landed in a familiar Kansas cornfield and promptly set about improving the human race. But at what point do good intentions and noble scientific devotion twist into hubris and evolutional obstruction? More pointedly, would the human race have been better off without a single Superman than it is with a whole family of them? Well, I hope you like text, because Cary Bates has crammed so much of it into this issue, an encyclopedia editor would say “damn.” The book is literally drowning in word balloons, caption boxes, talking heads and hyperbole, explaining the scenery and chatting about character struggles when it would be sufficient to illustrate them. That gives the issue a much more thoughtful pace, which seems appropriate for the kind of far-sighted questions the series seems to determined to ask, but won’t gain it any endorsements as a page-turner. At their core, the kind of observations and commentary Bates offers in this issue, not just into the origins of superheroes in the DC universe but also to basic human nature, are bitterly poignant. That they’re also so terribly long-winded and awkwardly non-conversational may ultimately hold this series back from being the modern classic it could’ve been. It reads more like a dissertation than a story, with moments of action occurring in the background of each panel simply to further the conversation and rarely to provide any measure of added drama or suspense. That central train of thought is compelling and creative enough to keep the issue moving along nicely, but it’s more like reading a good conceptual sci-fi novel with a loosely related string of illustrations than a traditional comic book. Speaking of which, Renato Arlem’s artwork is similarly unspectacular on the surface and rich beneath. Arlem’s work appears drab at first glance, literal and pedestrian without much cause for excitement, even in moments fueled by adrenaline. As the story progresses, though, the depth of his vision for this slightly skewed rendition of our world becomes clear, as does his intimate understanding of the El family and the complex emotions they work through as one hard question leads into another. His style isn’t flashy, it doesn’t make for good pin-ups, but it’s refined, sharp and intelligent. His unsuspecting, grounded artwork walks hand-in-hand with the concept-focused nature of the story itself. It’s great to see the old Elseworlds imprint alive and well with such an intelligent story at its fore. While The Last Family of Krypton may not be the most enthralling Superman tale ever spun, it’s right up there with his most thought-provoking. It has its weaknesses, and I’m not sure why Cary Bates didn’t trust his artist to convey some of the ideas he refused to remove from the dialog, but it’s successful in spite of all that. This series won’t hold the attention of the action audience for long, but those in search of mental nourishment will find plenty of food for thought. Borrow it.